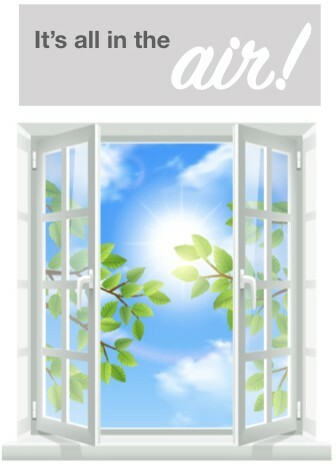 Indoor air quality is the air quality within and around buildings and structures. It is known to affect the health, comfort and well-being of building occupants. Poor indoor air quality has been linked to Sick Building Syndrome, reduced productivity and impaired learning in schools. Many people with allergies stay indoors when outdoor air is full of pollen and spores, however, the air inside your home can be up to FIVE times more polluted than the air outside. Our indoor air quality is important to human health because we spend over 80% of our time indoors. In fact, during the spring, when environmental triggers are at their highest, the effects on everyone’s health can be compounded by poor indoor air quality. People with asthma, allergies or lung disease can be greatly affected by poor indoor air quality and poor indoor air quality can affect the development in children and has been linked to lung disease later in life. If you are suffering from the health effects of air pollution, your symptoms can include: tiredness, headache or dizziness, coughing and sneezing, wheezing or difficulty breathing, more mucous in the nose or throat, or dry or irritated eyes, nose, throat and skin. You may notice these symptoms after a few minutes or hours and then feel better after leaving the affected area. This may be more noticeable if you have not spent much time in affected areas. For example, you may notice a difference after a vacation. It’s important to follow-up with your doctor if you’re noticing a pattern or have health concerns, but in the meantime here are four steps you can take as a homeowner to improve the air quality of your home. The most effective way to reduce your indoor air pollution is to spend some time to remove or reduce the problem at the source. Remove mold at the source by yourself (if it’s a small amount) or contacting a contractor if it’s a large amount. Take care when decorating as most products these days contain volatile organic compounds (VOCs) that release odours and pollutants into the air around them. Choose low-VOCs products whenever possible and ensure there is adequate ventilation during a renovation project. Check that your home has adequate air circulation and heat flow. Ensure your bathroom fans, kitchen fans and dryer vents are are all vented to the outside and not the attic or back inside the house. Tight insulation, too much humidity and other factors can lead to unhealthy air in your home or workplace, causing a number of heath problems. One way to mitigate this is to use a Heat Recovery Ventilator (HRV) to bring in a continuous supply of fresh, filtered air into your home while expelling stale air. An HRV also saves you money by warming or cooling the air coming into your home, depending on the season. At Ignite we can help you with improving your ventilation by assisting with ductwork modifications and/or installing an HRV to improve the quality of the air inside your home. Ensure the air circulating through your home is clean by changing your filter on a regular basis. Your filter traps the unwanted dirt and dust particles we unknowingly produce and prevents them from recirculating through your home. Mold spores, pet dander, cooking odors, dust, dust mites and their by-products are all factors that can be captured and reduced with your furnace filter. At Ignite we can supply you with furnace filters that allow for adequate air flow while capturing those unwanted dirt and dust particles circulating in your home. If allergies or other health issues are a concern for you, we can work with you to assess if your furnace can handle a filter with a higher MERV rating and provide any required enhancements to keep your system performing safely and efficiently. Ensure the air circulating through your home is disinfected from harmful microorganisms by installing a HomeShield Ultraviolet Light Purification system. This is a chemical-free method of purification that is installed into the ductwork of your HVAC system and it sterilizes the air by stopping the spread and growth of harmful viruses, molds, pet dander, bacteria and allergens from passing through your HVAC system into your home. HomeShield can help you breath easy and reduce the effects of season allergies and other heath issues. At Ignite we can help you to have a home that is free of pollutants, microbes, allergens by installing your HomeShield Ultraviolet Light Purification system. We love to work with homeowners to ensure their indoor air quality is the the best it can be. If you’ve identified some deficiencies in steps you need to take to improve your indoor air quality, give us a call @ 780.919.4916 to book a free quote and discuss the options available to your. With Spring Break around the corner and many of us looking for ways to escape this never ending polar vortex cycle, we wanted to remind everyone to remember to ensure your prepare your home before you leave to help avoid potential problems you won’t be able to address while you are away. While it is best to check with your insurance company to see exactly what steps you should take, we have six steps listed below that can help protect your home from water damage, heating/electrical system malfunctions and other possible threats while you are away for an extended period of time. Before you leave, turn off your main water line. If your furnace fails while you’re away, and the temperature drops, water in the pipes could freeze and potentially burst the pipes causing extensive damage. After you have turned off the main source, open up every faucet and drain the water lines. Go through your home and make sure the toilets, water heater (turn off the gas or electric supply first) have all been drained. 2. Check the thermostat’s settings. Reduce the temperature of your to around 15’C to save energy. You just need to keep your home warm enough so your pipes don’t freeze. Keep in mind that most thermostats are programmable now and run on batteries. If you haven’t changed your batteries this year, it’s time to do it before you leave. The last thing you need is your furnace to stop running because your thermostat dies! Don’t keep any food that is likely to go bad while you’re away and empty your freezer as much as possible before you leave. If the electric fails in your absence and then is restored, the food in your freezer will thaw and refreeze, which is very dangerous. If you are unable to empty your freezer, place a coin on top of a frozen ice cube. If the ice cube melts while you’re away, the coin will sink into the ice cube and will freeze inside of it once the power kicks back on. If this happens you will know that there was a power outage while you were away and now you can discard any frozen foods. Additionally, you should take out all trash, recycling and compost to avoid attracting critters. Electronics still use energy, even when switched off, so unplug small appliances (toaster, coffee machine) and extra lamps to help save on energy and protect against power surges. Confirm that your alarm systems are in working order and have been activated. You may also want to consider a couple of “smart” options such as “smart bulbs” and “smart plugs” that allow you to control lighting through your smartphone or a programmed routine. You could also install motion-sensitive exterior lights to discourage prowlers. Depending on the amount of time you are away, you may want to forward your mail and stop newspaper delivery and ask a friend to pick up items that may be left at your door. While you are away escaping the snow, don’t forget that your home is not! Arrange for someone to remove snow after storms or at the very least, to drive on your driveway making it appear as if you are home. Keep window blinds pulled and valuables tucked away out of sight. Lastly, avoid posting your travel plans or vacation pictures on social media sites until you are home, as potential thieves can use that information to learn when your house will be vacant. Depending on the amount of time you will be away, you may want to have your heating system inspected and serviced by a licensed professional before the onset of cold weather.Your furnace works overtime in the winter so if you intend on leaving it on over your vacation pay close attention to it’s condition. If your furnace should quit while you are away in the winter, your pipes can freeze up and the ensuing flood can cause massive damage to your home and even neighbouring properties for those residing in multi-residential complexes. At Ignite Heating and Air Conditioning we complete a comprehensive checklist to clean your furnace and ensure preventative measures are taken to keep your furnace running efficiently. We leave you a copy of our checklist outlining everything that was looked at, and any preventative maintenance tips that we might have for you. Give us a call @ 780.919.4916 today to book your annual furnace maintenance before you leave.